Earlier this year, premium-level collectible manufacturer Gecco revealed a 1/6 scale statue based on the enigmatic sniper Quiet, seen in Metal Gear Solid V: The Phantom Pain and playable in the multiplayer component Metal Gear Online. Standing at 11″ from the base to the crest of Quiet’s head, the ABS/PVC statue features two interchangeable faces, a knife, handgun and her signature rifle. The statue isn’t expected to release until late-June/early-July, though Metal Gear fans can still pre-order the Quiet statue for $270-300 from various outlets including Mamegyorai, D4TOYS and Play-Asia. The second statue in Gecco’s MGSV series, a work-in-progress “Venom Snake” statue was unveiled this morning. The Venom Snake statue will be modeled at 1/6 scale; as the collectible has not been finalized, exact dimensions are still unknown. 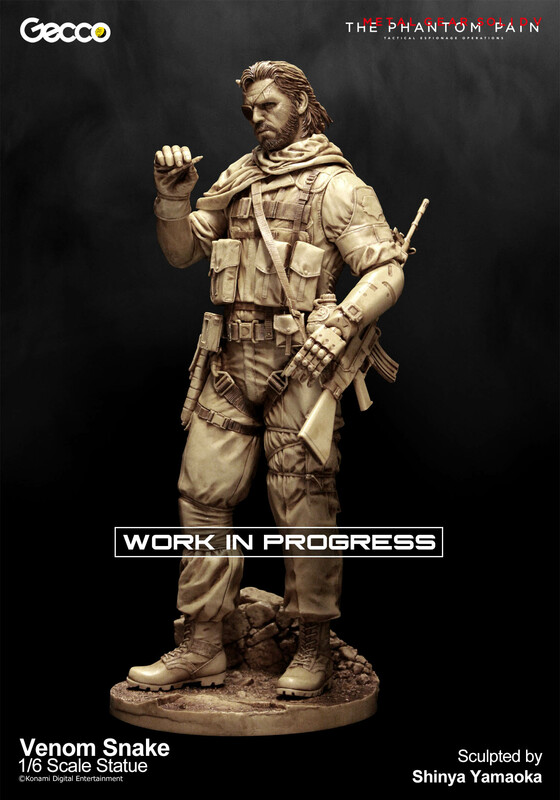 The uncolored prototype shown below depicts Venom Snake in the early stages of The Phantom Pain, equipped with the “Desert” uniform, scarf and cigar in his right hand. A price estimate has not been given for the future MGSV Venom Snake statue, however Gecco launched a new promotion this morning for avid collectors wanting both the Snake and Quiet statues; anyone who pre-orders the Quiet statue and the Venom Snake statue [once the pre-order window opens] will have the option of receiving a collectible 1/6 scale “The Puppy DD” D-Dog statue for free. The Quiet and Snake statues will both include a voucher for the buyer to redeem his or her free D-Dog collectible; both vouchers are required to obtain Puppy DD for free. The MGSV Quiet statue from Gecco will release sometime in late-June/early-May; release windows have not been announced for Venom Snake and The Puppy DD.